Ricoh GX100 Digicam Packs In The Innovation, new Ricoh digital camera offers EVF, image stabilisation and zoom. I'm feeling the love for Ricoh's fascinating new compact. Last time I looked at one of Ricoh's upmarket cameras, the Ricoh GR, I went all Victor Kyam and liked the camera so much I went out and bought the thing, and Ricoh's new GX100 has got my wallet-prising fingers twitching again. 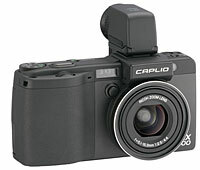 Never a company to run with the pack, the new Ricoh Caplio GX100 serves up an innovative feature set, with a super wide 24 to 72 mm wide zoom lens (35mm film equivalent), a fast F2.5 aperture and 10.01 Megapixel CCD sensor. Billed as the successor to the popular Caplio GX8, the GX100 has inherited some of the features of the GR, including the fabulous two mode dial system which makes up what Professional Photography magazine recently described as the 'best control system of any compact camera' (once you get used to it, Canon and Nikon compacts seem clunky in comparison). Another innovation that has set photo-nerd hearts a-fluttering in Chez Digi Lifestyles is the optional removable electronic viewfinder. This clips on to the hotshoe (yes, it's got one of them too) and offers a high resolution LCD display including all the necessary exposure information. If they get the quality right, this will be as close as you can get to a real street shooter experience in a camera this size. Architecture and landscape fans will also like the optional ultra-wide-angle 19mm lens for those big panoramic shots, with spot-on exposures guaranteed via a host of manual and scene modes and RAW file recording. As with the GR, macro focussing goes all the way down to a frankly ridiculous 1 cm (any closer and you'll be burrowing into the subject), with a built in CCD shift method offering vibration reduction. Ricoh claim that their 'Smooth Imaging Engine II' image-processing engine will keep the noise down, but with so many pixels packed onto such a small sensor, we expect the processor will be kept busy. With the Ricoh Caplio GX100 measuring up at just 25mm, this looks to be a great carry everywhere camera, and with a claimed battery life of 380 exposures, this looks to be a very, very interesting camera. European pricing hasn't been announced yet, but a Japanese site is quoting a retail price of 80,000 Yen (approx $670, 500 Euro, �340). Shutter speed 180, 120, 60, 30, 15, 8, 4, 2, 1 to 1/2000 sec. movie: 1/30 - 1/2000 sec.